- Upgraded hardware package from BFD, including heims, Delren bushings, grade 8 bolts, spacers, etc. I just picked this car up at the start of the season from the original owner, who had hardly used it. I planned/hoped to have a lot of time in Glamis but life and work just didn't allow for it and I've only had 2 trips all season. We live north of Sacramento, at the foothills of the Sierras and I want to pick myself up another RZR. This car is built very strong and includes dirt tires and could easily do hardpack and desert running, but where we wheel there is a lot of snow and rock-crawling that demands 4wd. 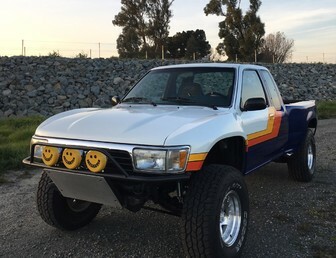 Asking: $35,000 including the Baja Pros/Dunesports on DWT beadlocks, dirt tires on Method non-beadlocks, and the Method beadlock wheels (wheels ONLY), all spares, etc. This car is 100% ready to go. I also have a DVD with DOZENS of pictures of the build of this car. You can see all the care and detail that went into it, as well as how everything is wired and plumbed so you'll never have to wonder where something is or how it was built.